On January 18th Barry Sugarman presented at a New Jersey Institute for Continuing Legal Education (NJICLE) seminar: “Litigating Nursing Home and Assisted Living Cases: The Basics and Beyond” at the New Jersey Law Center in New Brunswick. Mr. Sugarman offered his experience and insights into how to hold nursing homes accountable when neglect and abuse causes catastrophic injury and death to New Jersey’s elderly. 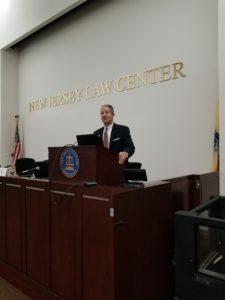 Mr. Sugarman’s lecture to more than 75 attorneys attending live and by webcast focused on: “Issues you don’t always think about…but should” in an effort to help other attorneys efficiently maximize results for the New Jersey families they represent. Mr. Sugarman has an extensive background of handling a wide range of nursing home abuse and neglect cases throughout New Jersey. In addition to nursing homes and assisted living facilities, he sues hospitals, rehab centers and home health aide agencies for elder neglect. His firm’s mission is “Helping Everyday People, Everyday.” This is much more than a than a catchphrase, it’s the driving philosophy behind his practice. Barry will co-chair the New Jersey Association for Justice’s Nursing Home “Boardwalk” Seminar on May 9, 2019 in Atlantic City where he will also moderate a panel discussion of retired Judges and attorneys who serve as Court appointed Mediators for nursing home negligence cases.